Janet Birkmyre is a class act on the track, with a plethora of titles in the discipline. 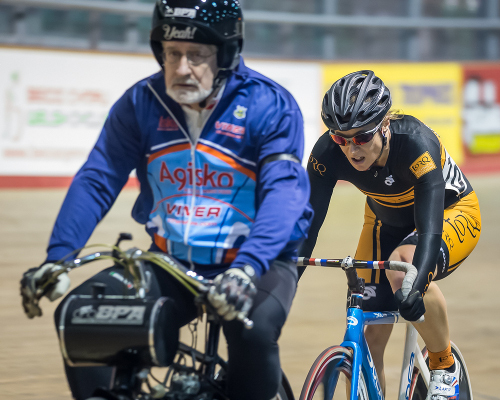 Janet recently competed in the National Track Championship, here’s her report of how things went. The elite National Championships are the battle ground for the upcoming talent, the Olympic Development Programme riders, and the established talent of the Olympic Podium Programme and with the 2012 Games still fresh in everyone’s mind, the chance to impress on the biggest stage in domestic track cycling produces some stunning performances. However there are some events where a bit of talent, some tactical guile, a little bit of luck and massive hunger for a win can produce a result that upsets the form book. The scratch race is definitely one of these events and so, while I would not have admitted it to many people, I knew that it was a race I could do well in and just possibly even win. Trouble was, one look at the start list and there were a large number of potential winners; double Junior Road Race World Champion Lucy Garner, multiple National Circuit Race Champion Hannah Barnes, Commonwealth Games sprinter Charline Joiner and newly crowned National Points Champion Corrine Hall were four of the riders who I knew could take the title and one of the challenges would be deciding who to watch and who to follow. A field of 19 riders took to the line and the early pace was quick, but it was not enough to drop any riders and only opened up the occasional gap. The first half of the 60 lap race was relatively uneventful, with the first proper move coming at around half distance when Eileen Roe attacked off the front. She was quickly joined by fellow Scot, Charline Joiner and I sensed danger. I did not want to show my hand too early, but thought that it could stick and worked quite hard to get across to them. Sadly, it was a wasted effort, the moved lasted only a couple of laps before the bunch caught us and we were all together again. I took the opportunity to recovery and was nowhere near the front when the Eileen tried again to escape, this time she got a quarter of a lap up on the bunch and with only seven to go, I thought we might be watching the gold medal ride away from us. The bunched worked well to reel her in and with only three laps to go the race was back on. It was Hannah Walker (two times Derny Paced National Champion) who was the first to jump, she got some height and launched herself with a huge effort. I know her well enough not to hesitate, so I put my head down and set off in pursuit, I got to her with two to go and we were joined by Lisa Daly. The three of us had a small gap on the rest of the field when we heard the bell and I knew I had to strike for home. So many thoughts went through my head in what could only be 15 seconds of 100% effort – I was just waiting for the bunch to pile over the top of me and knew that only if I give it absolutely everything, would I be able to live with the disappointment. I tore up the back straight, hammering the pedals, into the final bend and still no-one was challenging and so, as I entered the home straight, I took a quick look over my shoulder and simply could not believe my eyes – there was no one there! Lisa hung on for silver, but sadly Hannah was swamped by the field and it was Kayleigh Brogan who picked up the bronze medal. 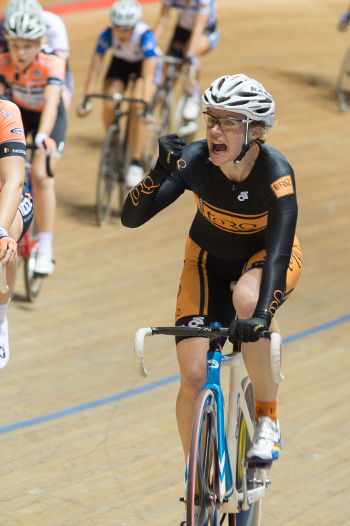 The race was summed up by BC as “The women’s scratch race took a surprise twist when veteran rider Janet Birkmyre of Torq Performance produced a stunning sprint to take gold in a field where most of the favourites were over 25 years her junior”. The first person I look for whenever I finish a race – whether it has gone well or badly – is my husband, David. He was in the back straight “pits” area with the biggest grin on his face. He knows better than anyone, what this win means to me, although we will have to leave proper celebrations until after the World Masters next week. Pictures courtesy of Guy Swarbrick from www.swarbrick.com and www.trackcycling.me.uk.